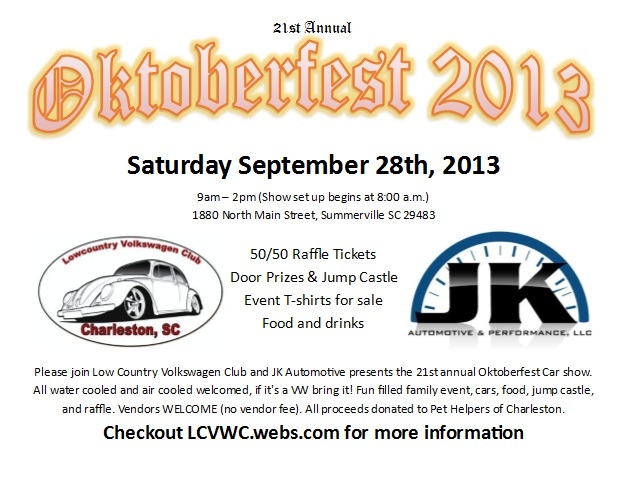 Lowcountry Volkswagen Club and JK Automotive present the 21st annual Oktoberfest Car show. All water cooled and air cooled welcomed, if it’s a VW bring it! Fun filled family event, cars, food, jump castle, and raffle. Vendors WELCOME (no vendor fee). All proceeds donated to Pet Helpers of Charleston. Food and drinks on site from 10:00 a.m. to 2:00 p.m.